Note: This article was updated in October of 2018. There’s plenty of CCGs out on the market today and most of them can be acquired completely for free. From the highly addicting Hearthstone: Heroes to Warcraft to the new beta releases of Eternal, there’s bound to be a CCG out there that you’ll want to give a download. We’ve compiled our personal favorite CCGs to enjoy right now. Take a look at our picks down below and let us know what your current favorite CCG is by leaving a comment! It’s also worth noting that this particular article is not ranked in any specific order. Coin Cryptis more of an RPG than a trading card game, but it does include elements from the genre within its combat system. Players take control of the Lootmancer who has the ability to use special coins that contain three unique abilities. Through the use of these coins that either allows players to attack, heal, or shield themselves from enemies, the Lootmancer will battle against enemies on his journey to find new and powerful loot. Tossed into this RPG style video game are also rouge-like elements leaving players to carefully plan out their next move or it very well could be their last. I don’t plan on spending too much time on Magic The Gathering Online because Magic The Gathering is one card game that is known and played by an enormous amount of players offline as it is online. Honestly, it would be shocking to stumble upon a fan of trading card games that did not know or have already played Magic The Gathering. If you’re a fan or someone that’s new into the franchise then you may want to hit up Magic The Gathering Online which is a video game adaptation of the card game where players can purchase virtual packs and battle against players online. Not only does the game play out similarly to the card game but it doesn’t forbid players from trading their cards to better complete a desired deck. There’s a whole in-game economy that allows players to trade cards, sealed packs, and even avatars. SolForge is another free-to-play video game that is claiming their path towards a new genre of Digital Collectible Game or otherwise known as DCG. This particular video game came from a successful Kickstarter campaign where developers Stone Blade Entertainment made some pretty enticing promises that will make SolForge a game worth checking out. While the game doesn’t differ too much from other trading card games, SolForge plays out a bit more tactically with cards consistently leveling up throughout the game. Players will find that cards will be rewarded to them just by playing the game, there’s a nice range of modes within the game as well such as playing online with players, battling against AI opponents, entering tournaments, along with completing the campaign mode. Visually, the game is rather nice thanks to the team behind the game development which includes Gary Games, creator behind the award-winning mobile card game Ascension, along with Richard Garfield, originator and designer of Magic: The Gathering. Infinity Wars is another popular trading card game that is a bit different from some of the others on this list. Gameplay is played out with players having the ability to partake in simultaneous turns which means that players can tweak their gameplay while opponents start their turn. Besides the gameplay element, Infinity Wars may be one of the more entertaining trading card video games available as the maps and cards are all animated. Similar to Magic The Gathering Online, Infinity Wars also features an economy within the game. Players are able to trade and sell their own cards which is always a nice feature to include in these trading and collectible based card games rather than forcing players to purchase in-game currency for new packs or select cards. Might and Magic Duel of Champions is a trading card game that is based off of the Might and Magic universe making it an appealing trading card game right off the bat for fans of the franchise. This is your typical style trading card game where players will craft a deck to battle against other players or enter tournaments. Decks are comprised of a hero based character, which will determine a player’s faction and abilities, along with various creatures and spell cards. With over six hundred cards to collect, all based around the lore of Might and Magic, this game will give players a massive amount of different deck strategies. Elemental Kingdoms is a trading card game that is featured on mobile platforms where it’s currently available through Google Android and Apple iOS. This is a more basic style card battling game that includes a campaign mode along with the ability to face against other online opponents. Each player can of course craft a deck, but the gameplay is a bit straightforward as the cards play both a role in attacking and defending the player’s overall health. During portions of the game, players can opt to have the game automatically finish the game allowing players to focus on the upcoming battles and their personal deck builds. Ederon is a free-to-play trading card game that’s available on Windows, Mac, and Linux. This is an older fantasy trading card game that still continues to run strong with its fan base while also containing an enormous card selection. Developers claim that there are over a thousand different cards to collect and play so we’re pretty sure deck builds and strategies will change constantly. It’s worth noting that all of these cards can be traded, sold, or purchased from other players within the game. Ederon is a bit dated compared to other titles on this list but it’s also an in-browser video game so players won’t have to worry about their PC specifications in order to run this game. Urban Rivals is a free-to-play trading card game that is featured both on PC and mobile platforms. Originally released back in 2006, Urban Rivals is still finding a massive amount of players competing online. This is a more cartoonish style card game that is easy to grasp and fun to play. Essentially the game features cards based off of real people or known fictional characters and all come packed with their own select abilities and clan factions. Each week developers add new cards into the game which constantly changes up how players strategize their deck builds, though only eight cards are contained within a deck build. Developers keep the game lighthearted and fun with short battles and entertaining cards so we suggest checking out Urban Rivals if you’re interested in trying out the trading card game genre. Card City Nights is a very different from some of the other video games on this list as it takes the traditional trading card game style gameplay and mixes it within a quirky adventure game. While within the center of this game is based around a trading card game battle system, Card City Nights follows a story and adventure with a character hunting down legendary cards with intentions to win the cities upcoming and biggest card competition tournament. Because there are no in-application purchases available, players will be able to collect all of the different cards while progressing through the eight-hour campaign. As of right now, players can play Card City Nights through Steam, Apple iOS, and Google Android. Hearthstone: Heroes of Warcraft is easily one of the biggest if not the biggest CCG right now. The characters and races from the popular Warcraft franchise are all accounted for in this exciting card battling game. This is an easy to grasp CCG which allows players to purchase packs and craft cards centered on a specific hero card. Each hero card has their own set of unique cards and abilities that seem well balanced against other hero cards. Outside of expansions and facing other players online, the game rewards players with in-game currency along with free card packs simply be completing daily quests. 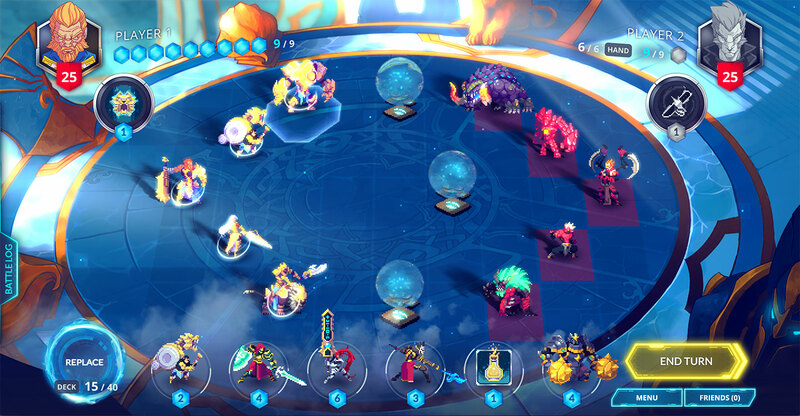 Duelyst is an interesting take at CCG. The game acts like a traditional card game where players will draw and discard cards while crafting their decks. However, unlike the traditional card games, Duelyst offers more of a tactical-style combat when the cards are played. Set on a board, gamers are able to maneuver around the map offering another whole level of strategy. The Elder Scrolls franchise is massive and holds a deep lore. Much like Warcraft, The Elder Scrolls spawned off their own CCG known as The Elder Scrolls: Legends, where players can gather characters from the franchise. Overall, the game plays out like the much-beloved Hearthstone: Heroes of Warcraft where players can play cards and use them freely to attack other cards on the board. Where the game differs is the fact that there are available options when playing cards. For instance, the game offers two-lane to lay down cards and depending on where the card is placed will determine if that card is in immediate danger. Furthermore, there are extra rules placed on when cards are picked up making it more of a challenge on when to strike against your enemy and when to hold off. At the time of writing this, Eternal is still in beta but it’s quickly becoming a must-play if you enjoy CCGs. Overall the gameplay plays out a bit like Magic The Gathering though because it’s still in beta, the game will be tweaked a bit before its final release. If you want to enjoy a CCG without sinking money into it for new cards and equipment then you’re going to really enjoy Eternal as the game rewards players quite often. After being a hit bonus game to play in The Witcher 3: Wild Hunt, developers CD Projekt RED decided to develop a standalone title for the hit card game Gwent. The title plays out similarly to the other digital card games available within the market today such as Hearthstone along with the physical card game, Magic: The Gathering. Yu-Gi-Oh has been a popular franchise for a number of years now and with the franchise being based around card collecting and battles, it was bound to have a nice collection of video games. One of those titles that are thriving today is Yu-Gi-Oh! Duel Links which is a digital collectible card game for iOS, Android, and lastly the PC platform. Within the game, series character Seto Kaiba has managed to develop a virtual reality world that could host the world’s greatest duelist to battle. For the most part gameplay of the card, battles follow the standard rules of the trading card game. However, there are a few differences depending on the game mode. A big component of the game is obviously gathering new cards which can be done by purchasing card packs from the in-game shop and depending on the BOX players decide on will ultimately determine their odds of successfully pulling a rare card. Additionally, being a mobile title, players can also make use of the PvP modes where friends can battle against each other all while attempting to rank higher in the leaderboard. Shadowverse is a free-to-play digital collectible card video game which is available on iOS and Android worldwide while the PC platform remains to be slightly limited in markets. This particular card game seems to thrive more within Japan but it’s still widely available within other markets around the world. Much like Hearthstone, Shadowverse continues to receive new card packs regularly that add a new standard element to the battles you’ll endure. Likewise, starting out the game, there is a campaign mode available to help players learn the overall rules of the game while earning basic card packs though, at the heart of it all, there is still a heavy emphasis on players learning the cards and crafting up their own strategic decks. One component that the development studio hopes to drive home with Shadowverse CCG is that the game has less of an RNG issue and instead everyone has the ability to win games simply by being strategic and making the right judgment calls.